After the candy is eaten and the costumes are put away, our focus shifts to our natural world’s final glorious display of the year. It’s official. It’s autumn in Maryland. Living in the Old Line State, you know how lucky we are. Although small geographically, the landscape is quite diverse and complex, often referred to as America in Miniature. One of the best parts of the season is watching the leaves change from green to gorgeous shades of orange, red, yellow and brown. After the colorful show, the leaves fall and trees stand bare until the arrival of spring. Why does this happen? It has to do with plants’ food and the time of year. Plants make their own food using sunlight and chlorophyll—the chemical that makes leaves green. Fewer hours of sunlight in the fall tells trees that winter is coming and they can stop making so much food. The chlorophyll then breaks down and reveals the reds, oranges and yellows typically hidden by green. In the meantime, cells grow over spots where the leaves are attached in order to save water. Once the water is gone, the leaves dry out and fall to the ground. From the barrier islands, cypress swamps and Delmarva bays of the Eastern Shore to the mountain boreal bogs, caves and limestone woods of the Appalachian Plateau, our state boasts a wide range of typography and habitats that support an impressive variety of flora and fauna. In fact, more than 160 native or naturalized tree species are found here. When you finally put that lawnmower away in late September, summer falls into autumn, first in Western Maryland. 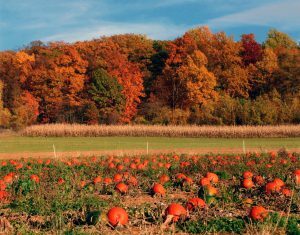 Over the course of the coming weeks, fall foliage tours and festivals are family weekend fare. Soon after the last leaf has fallen in Leonardtown, Thanksgiving Day will herald winter’s imminent arrival and the whirlwind holiday season. With input from the Maryland Office of Tourism, the Department of Natural Resources publishes a weekly Fall Foliage and Festival Report online to give Marylanders and our visitors a heads up on the coming weekend—where the leaves are turning, recommended driving routes and events along the way. A showcase of world-class horse sport features Olympic-caliber athletes taking on daunting courses with impressive speed and accuracy. The festival also features a kids’ corner, live music, miniature horse demonstrations, a trade fair and more. This free event raises awareness about farm-raised oyster aquaculture. Learn how our local community is restoring wild oysters while creating new reefs from recycled shell and concrete reef balls. A celebration boasts boat-building demonstrations, nautical crafts, crab picking, oyster shucking and a look into the life of a waterman. Experience pleasant diversions during the French and Indian War with colonial games and musket firing demonstrations. 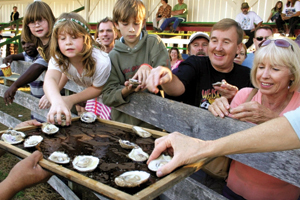 There also will be a bonfire at 7 p.m.
A celebration of the opening of the Chesapeake Bay oyster season, this event includes the National Oyster Shucking Championship and the National Oyster Cook-Off. Activities include an apple butter boil, corn shelling, pumpkin decorating, Scales & Tales, scarecrow wizardry, food and live music. Point Lookout was a target of British raids during the War of 1812. This event showcases American and British camps, living history programs and weapon demonstrations. One of the biggest annual Tall Ship gatherings in the Atlantic region, the waterfront is packed with schooners, ships and wooden boats, plus world-class musicians. The largest nighttime parade on the East Coast, the Alsatia Mummers is a lavish event with bands, floats and mummers in outrageous feathered garb. A re-created Eastern Woodland Indian village and demonstrations honor the lasting legacies of Maryland’s native peoples. This free event includes a park-wide scavenger hunt, honey and beeswax demonstrations, live animals, mill tours, music, a flying pumpkin cat-a-pult and much more. Appears in Vol. 20, No. 4 of the Maryland Natural Resource magazine, fall 2017.